DBV-Technologies’ Viaskin could be used to combat allergies and immune conditions too! One French company is determined to make the world a better place for sufferers of allergies and allergic conditions. DBV Technologies (DBV Technologies.com) has been working on a revolutionary product, the Viaskin patch, which aims to treat several different food allergies, as well as Eosinophilic Esophagitis – more details may be found here: http://www.dbv-technologies.com/en/viaskin-products/viaskin-plateform. Whilst it has only been recognized recently that this condition is a quite common one, the other targets of the Viaskin patch have been around for a long time, namely peanut allergy, hen’s egg allergy and cow’s milk protein allergy. All of these allergies are relatively common, with hundreds of thousands of people having to receive emergency treatment due to allergic reactions triggered by peanuts every year. Cow’s milk protein allergy, meanwhile, also affects large numbers of babies and young children. 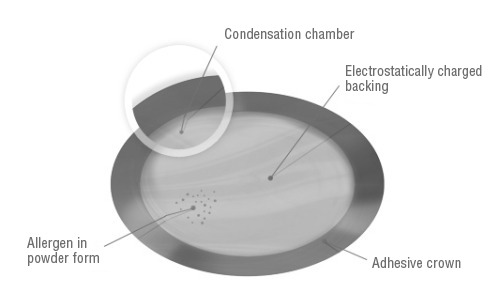 The diagram of the Viaskin patch below shows its main features, including the all-important condensation chamber and the electrically-charged titanium backing. One of the advantages of this epicutaneous approach is that it can be easily adapted to tackle other kinds of allergies.